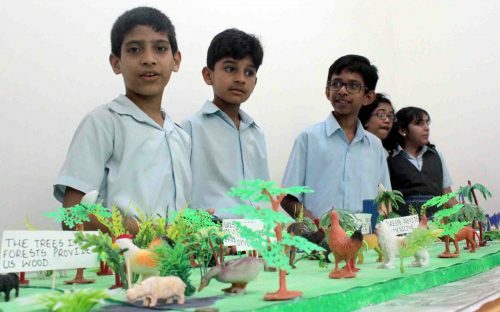 Panchkula, July 31, 2016 : Holy Child School, Panchkula organized a Science Exhibition, ‘Galaxy 2016’ to celebrate the scientific innovations of their budding stars from Classes 1 to 10. The event was inaugurated by Dr. Ashok Nanda, Former Principal of DAV College, Chandigarh. The young scientists showcased their talent through various futuristic models, the prominent among them being Vacuum Flush, Water Purifier using Corn Cobs, Hydraulic City, Vertical Multi-Layer Farming, etc. Speaking on the occasion, Dr Nanda applauded the teachers and the students for excellent presentation and the tremendous effort to put up such a good show. The parents expressed their joy and congratulated the staff and the students for demonstrating high level of the models. The chairperson, Mrs. Neena Trehan highlighted that the prime motive behind the Science Exhibition was ‘Learning by Doing’. It aimed at providing the students a platform to demonstrate their scientific acumen and develop their inquisitive minds and analytical skills under the able guidance of their teachers.